One of the best stories about unsung heroes being discovered on an international stage is the one about the little Mennonite kid from Canada who took his elementary-school education to a pinnacle of engineering success in the United States. Peter D. Friesen, inventor of the world’s first Unified Hydraulic Jacking System, created four entries in the Guinness Book of World Records before his team received America’s most prestigious award for leadership and excellence in Engineering – The Opal. Born to anarchy in post-revolutionary Russia and raised in depression on the Canadian prairie, Pete Friesen embarked on a courageous journey to the forefront of a highly technical vocation where professional engineers decried his methods and professed the impossibility of his tasks. Blessed with an ability to visualize simple solutions to very complex problems, Pete prevailed. During his sixty-year career, he relocated almost 5,000 buildings and helped preserve many of America’s most fragile architectural treasures. Following Pete’s trail through uncharted territory, we learn how to move buildings and we gain insights into the nature of the people who move them. This is a story about passion and determination. This book informs while it inspires. Although a television mini-series has touched on the subject, this is the first written summary of numerous record-breaking building moves of the most recent half-century. Many people in the international structural-moving industry are happy to see their ancient art celebrated in print, and many professional engineers in North America are intrigued by Pete’s story of perseverance and genius. Among millions of people unfamiliar with the subject matter, there are many who enjoy learning about the art of house moving while also following an epic personal journey. A heart-warming story about an extraordinary man doing extraordinary things, this book has universal appeal. Peter Rowlands is a person of varied talents and master of none. Along with serious skiing and paddling addictions, his 40-year aviation career included two decades of volunteer effort in the realm of river ecology before his writing and photography tendencies led him into film production where—coincident with early retirement from Air Canada in 2003—he helped research and produce the bio-documentary -entitled Moving Man-Made Mountains. 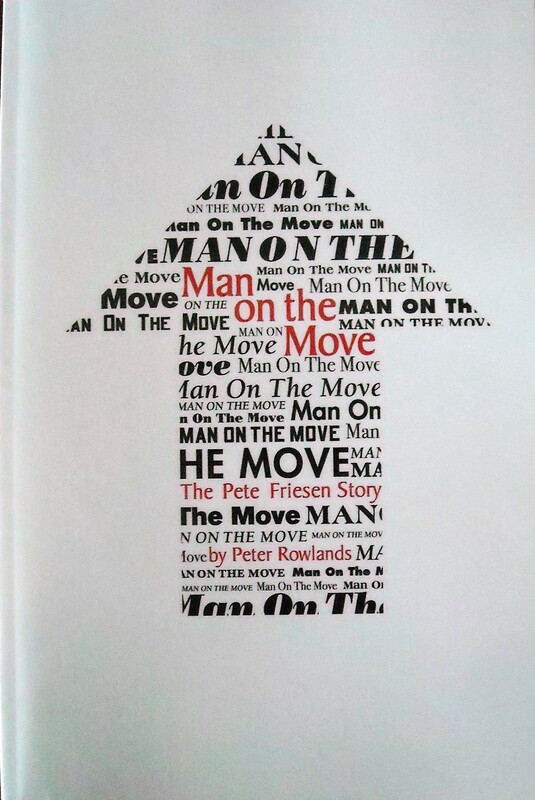 Subsequent to completion of the film, Peter was invited by its subject, Pete Friesen, to consolidate his numerous technical reports and extraordinary tales into a written biography entitled Man on the Move (self-published in 2009). Ever a part-time writer and would-be filmmaker, Peter lives north of Toronto with his best friend and favourite editor, Susan.